Stu and I were lucky enough to be invited to a wonderful event last night. 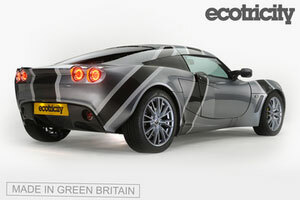 It was the launch party for the new green bond from Ecotricity and their wonderful new wind powered car; the Nemesis. Ecotricity are an amazing and truly inspiring company, they see that it’s not enough to sell green power but that we need to invest in increased capacity and the ability to produce more green energy otherwise there just won‘t be enough available to make the kind of different that we need to. They invest in wind turbines and produce electricity from them which is where the “wind-powered” bit comes from. This electricity goes into the grid and is used to power everything from boiling the kettle for your morning cup of tea to charging up your electric (“wind-powered”) car! Lucy Siegle who writes on green issues for the Observer was there filming the car and the amazing reaction to it so hopefully you should be able to watch the film via the Ecotricity website soon. The Ecotricity eco bond is a way for you to invest your money to get a better return that you would at the bank (7%) and because you’re investing directly with Ecotricity you enable them to invest even more in building capacity to product more green energy quicker. It’s a definite win: win situation. If you’re looking for simple ways to go green and really make a difference without it affecting your life (other than giving you a nice warm fuzzy feeling that you’re doing your bit), then switching your electricity to Ecotricity is a great step. They invest far more than any other energy company in new sources of green energy, which is what we need to do if we want to reduce our reliance upon fossil fuels and make a sustainable change for the future. Ecotricity don’t charge any more for their energy either, and price match with the 6 main electricity providers so when there’s no premium for using green electricity, what other excuse can you think of for not using it? We can’t change the world overnight, but we can make a difference by working together to take steps in the right direction. Switching to Ecotricity is a very easy first step. We’ve changed over, and I hope you will too. Switch now….